This healthy carrot cake is just as good as any carrot cake you’ve had, but it’s gluten-free, dairy-free, and paleo! It’s made with almond flour, sweetened with maple syrup and dates, and frosted with whipped coconut cream. This healthy carrot cake doesn’t taste like “diet” cake. All of my tasters have loved it – even those who don’t like traditional carrot cakes like my carrot cake with pineapple. The combination of moist carrots, sweet and chewy dates, and the crunch of pecans makes for a cake that’s more of a sensory experience that your typical light and fluffy carrot cake. Carrot cake tastes like a spice cake that is sweetened mostly with carrots instead of sugar. 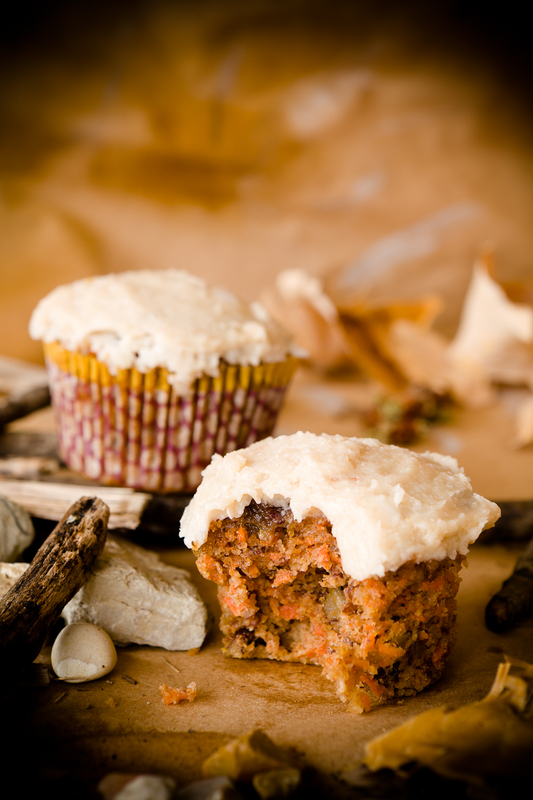 In fact, carrot cake evolved from medieval carrot pudding. During medieval times, sugar was expensive and hard to get. The carrots were a cheaper alternative to using sugar. This version of carrot cake has a nutty flavor from the almond flour and the pecans. Almond flour is made from finely ground almonds. It’s basically the same thing as almond meal, but almond flour is typically ground finer than the meal. While I used almond flour in this recipe, you can use less finely ground almond meal and it will work just fine. While you can make this recipe without a food processor if you have great knife skills, I strongly recommend using a food processor. You’ll need it to food process the carrots and the dates, and combine all of the ingredients together. This recipe works best if you food process the carrots on their own. That way, you can get them the right size and then measure them out. You want the carrot pieces to be about the size of cooked quinoa. The same goes for the dates. You’ll need to food process them on their own so that they can be measured. I always buy pitted dates for baking, but if yours aren’t pitted, be sure to pit them before processing them. The goal is for the dates to become a big sticky mass. Because the dates are so thick and sticky, they don’t integrate well with the other ingredients. This is, again, where the food processor can come in handy. You’ll need to food process everything (except the dry ingredients) until the mixture is smooth. I usually buy chopped pecans. If you buy whole ones, my final tip is to use the food processor yet again to chop up the pecans. You don’t need to worry about cleaning the food processor out between each step. It won’t matter at all! If you aren’t dairy-free and want to splurge a little, go ahead and frost this cake with cream cheese frosting. Whipped coconut cream is a wonderful alternative, though. It has a light coconut flavor and couldn’t be any easier to make. Start with a can of full-fat coconut milk. This is not coconut water; it’s the coconut milk that comes in cans – usually in the Asian aisle of grocery stores. Do not shake the can. You want to make sure that the cream is sitting on top when you open it. Open the can and carefully scrape the cream into a bowl. Save the liquid for smoothies or cookies. Use a whisk or a hand mixer to whip the coconut cream until it’s light and fluffy. Spread the coconut cream on the cake! See? I told you it was easy! And, coconut cream tastes wonderful with no need for any sugar! Can You Make This Cake as Healthy Carrot Cupcakes? Yes! I originally created this recipe back in 2012 as a paleo cupcake. You can see that photo below. I used a coconut oil frosting on the cupcakes, but I now prefer the coconut cream I described above. This healthy carrot cake is just as good as any carrot cake you've had, but it's gluten-free, dairy-free, and paleo! It's made with almond flour, sweetened with maple syrup and dates, and frosted with whipped coconut cream. In a large bowl, combine almond flour, salt, baking soda, cinnamon, nutmeg, and cardamom. In a separate bowl, mix together eggs, maple syrup, and oil. Mix chopped carrots and pureed dates into the wet ingredients. Stir wet ingredients into the dry ingredients. Pour batter into a greased 8" square baking dish. Bake 40 minutes or until a toothpick comes out dry. Open both cans of coconut milk and scrape the coconut cream that sits on top into a medium-sized bowl. Use a whisk or a hand mixer to whip the coconut cream until light and fluffy. Spread the coconut cream on the cake. Store the cake in the refrigerator for up to five days. Almond flour and almond meal are the same thing only almond flour is more finely ground. You can use either in this recipe. If you aren't dairy-free and want to splurge a little, you can frost this cake with cream cheese frosting. If you make this recipe as cupcakes, adjust baking time to 20 minutes.